At Sterling Ridge Log Cabins in Vermont Cabineering and glamping is being made popular by Boomers, Xers and Millennials. They are also making popular again: hiking, trekking, exploring, kayaking, mountain climbing, paddle boarding, cycling and so much more. But a new trend makes communing with nature even more attractive to would-be explorers. What if—after you’ve spent the day happily wandering hiking trails, maybe identifying animal tracks and wildflowers while taking in the stark beauty of the Vermont mountains; or paddling a kayak lazily down a crystal clear river—you didn’t have to pitch a too-small tent and unroll a lumpy sleeping bag? What if—instead—you could take a refreshing shower in your cabin tucked in the woods, pop the cork on a bottle of wine on your private porch, ward off the nights’ chill at your fire pit, stare up at the sky filled with glistening stars, relish in the new memories of your days’ adventure, and then retire to the comfort of your bed with clean, fresh linens? The movement is referred to as “glamping” (short for “glamorous camping”) or “cabineering”, and at Sterling Ridge Resort and Log Cabins, we’re way ahead of the trend! At The Ridge, you can enjoy the beauty of nature and never leave those all-important creature-comforts behind! 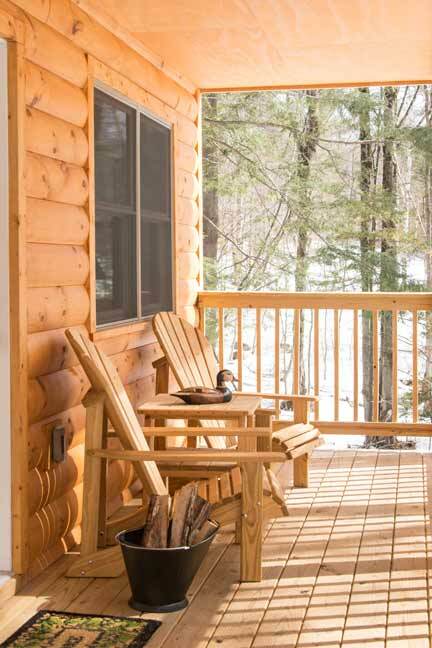 Our cozy log cabins provide privacy and comfort for active and passive nature-lovers alike. Our unspoiled property has marked trails that meander through meadows, up hills, and around a pristine pond. Cast a line to hook a trout in the Lamoille or the Brewster River! April is the beginning of trout season here in Vermont. You can go it on your own or with the help of the guides and equipment from Green Mountains outfitters, just down the road from Sterling Ridge Resort and Log Cabins. Vermont Canoe and Kayak is a stone’s throw away, and offers a number of guided tours on the Lamoille. Our designated dog-friendly cabins allow your whole family to be a part of the adventure. Get back to nature without leaving your civilized side behind at Sterling Ridge Cabins!